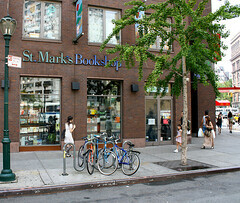 St. Mark's Bookshop was established in 1977 in New York City's East Village. Re-located 136 East Third Street. The area is a community for students, academics, artists, and other discerning readers. Nearby schools are New York University and The Cooper Union. There are also many vintage clothing stores, antique and used record stores nearby. It is a great place for spending an afternoon with books and coffee. 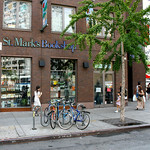 The bookshop opens Monday through Saturday from 10am to Midnight, Sundays from 11 am to Midnight.